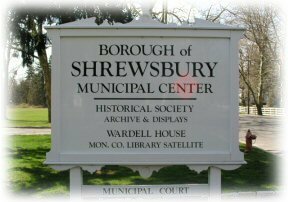 Mayor of Shrewsbury Official Blog Site | A day by day account of Cllr Tony Durnell the Mayor of Shrewsbury Mayoral duties from 16/05/11 to 14/05/12 – From 14/05/12 posting blogs as Tony Durnell Past Mayor of Shrewsbury. TODAY SAW THE MOD AND THE BRITISH GOVERNMENT LEAVE THE 1st THE QUEENS DRAGOON GUARDS ALONE WHEN THEIR COST CUTTING AXE FELL. THANKS GOES TO ALL WHO HELPED SAVE THE REGIMENT. THE MPs WHO BACKED US, PAST AND PRESENT MEMBERS OF THE REGIMENT AND A SPECIAL THANKS GOES TO RICHARD GOLDSBROUGH. 1st The Queen’s Dragoon Guards (QDG) is the Cavalry Regiment of Wales and the Border Counties (Shropshire, Herefordshire and Cheshire). It is the senior Regiment of the Line in the British Army and has 324 years of distinguished history. It is one of the most operationally experienced Regiments in the Army having seen action as the reconnaissance force during the First Gulf War in 1990/91, the Second Gulf War in 2003 and in Afghanistan in 2008/09 and their latest tour being 2011/12. When the MOD cuts were first hinted at, past and present members of the QDGs realised that we were in the firing line to be axed, this was due to what is viewed as ‘system of precedence’ in the Royal Armoured Corps. Traditionally, under that system, the regiments that have survived the longest unchanged are put in the firing line first to be amalgamated into other brigades. Put simply it is a process of “your turn next”. The possible threats to the QDGs sparked anger on the social networking sites, Facebook, Twitter and also through my Blog, where supporters of the regiment are being urged to contact their MPs. Please click on the following links to go to the pages within the blog that asked for your help, thankfully you did come out and help in large numbers. I would like to say thank you for spending your time to our call to arms. Today he added: “We left no words unsaid and no deeds undone….And we, now have no tears that need shedding because….We grabbed the moment”. When I last spoke with Richard he was on his way to the pub for a well earned pint or three, and I did likewise, seperated by distance yet together in mind and spirit. By involving our MPs in the way that we did, by the number of MPs that backed us, the pressure we put down in the halls of Westminster by asking the right questions, having answers to their questions and by showing sound reasonable alternatives I think and feel that the MOD had to change their outdated reasoning of “Your Turn Next”. I just hope that Cardiff will be rady for the Post Exercise Party!!!!!!!! WELL HOT OFF THE PRESS!!! 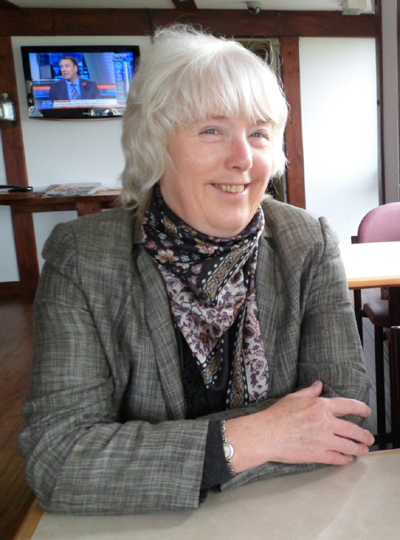 THE PAST MAYORESS TRICIA DURNELL HAS STARTED HER VERY OWN BLOG. SHE IS NEW TO THIS AND NEEDS SOME HITS ON HER SITE. Tricia has her new Blog and it will develop as she learns how to work with WordPress and downloading plus the editing of her pictures etc. 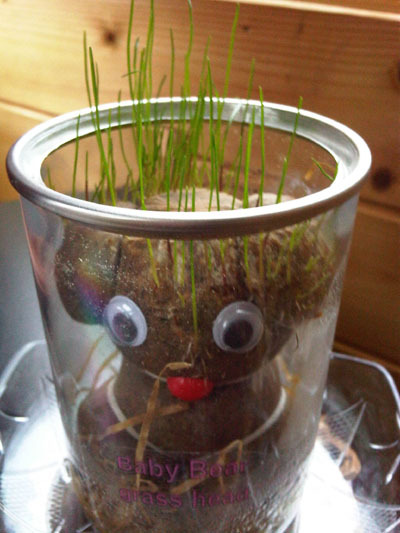 Tricias new Blog will contain pictures and information about her art and our garden. ‘H’ says thank you as well. 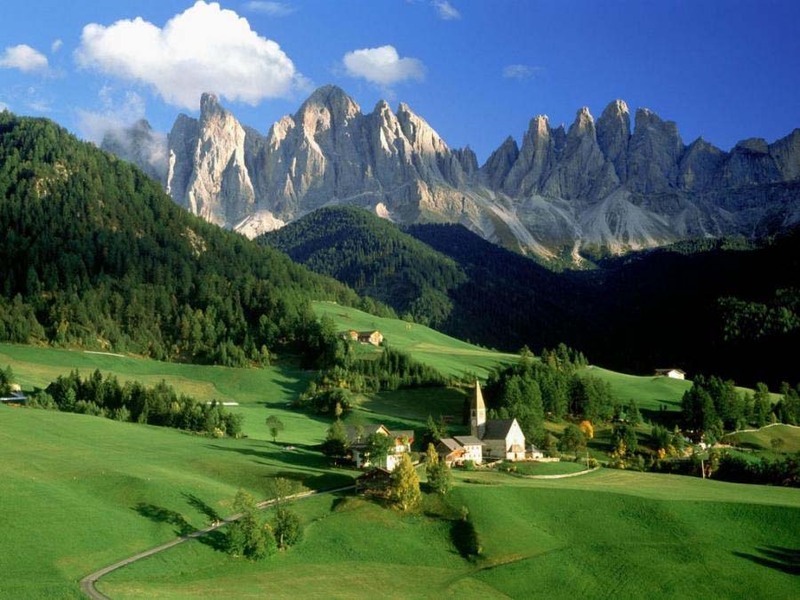 HI FRIENDS, I THOUGHT THAT I SHOULD INFORM YOU THAT I HAVE A NEW BLOG SITE. I hope that you continue to follow me and I will do my best to update my new blog as often as I can. To start with I have taken it to the end of May so that you do not have that much to take in, but there is plenty of stuff waiting in the wings already. If you are wondering what the strange object in the top left of this post is well meet ‘H’ some students we met will remember ‘H’ when I aquired him/her hence ‘H’ as a name and nit ‘it’. 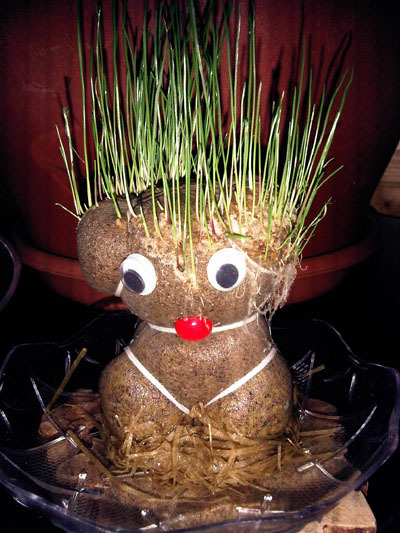 You will see ‘H’ a fair bit on my new blog as a kind of mascot, my wife Tricia thinks I have gone made, maybe but whatever its fun and relaxing seeing ‘H’ change week by week. See you at my new Blog, but still come back to this site to see who get some money from my Mayoral Grant Fund, being released soon. 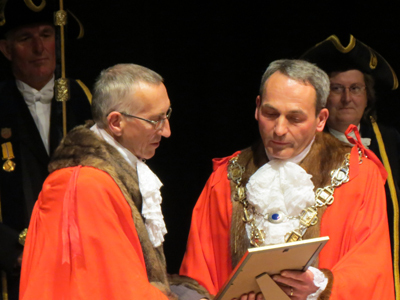 I would like to thank you all for following me through my Mayoral year and I hope that it has been an insight of the workings of the Mayor and the team of dedicated staff that work to ensure that the people of Shrewsbury retain its Mayor and all of its history. 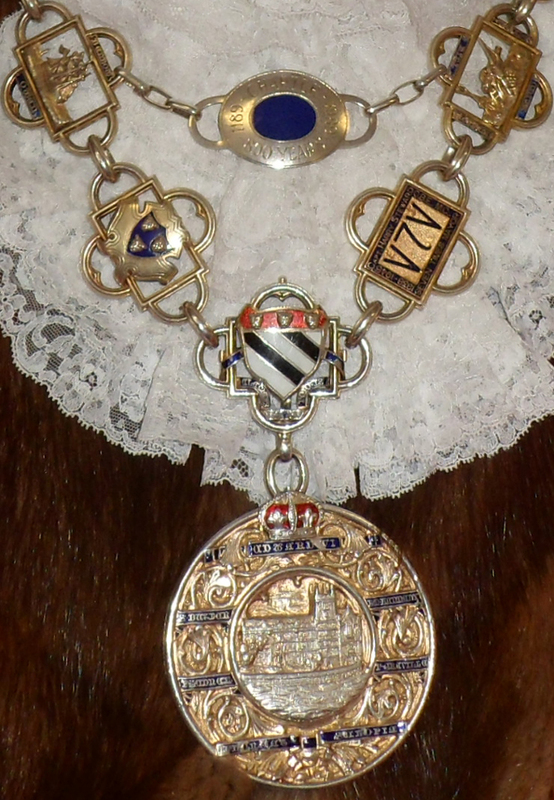 Also I would like to thank all of the members of the Freemen of Shrewsbury who help protect the Mayor on Civic parades etc, also to businesses of Shrewsbury who helped sponsor many of my events to raise money for charity, last but not least a big thank you to the residents of Shrewsbury for making our year such a memorable one. We will never forget the warm greatings you afforded us and allowing us to make so many new friends. Thank you. 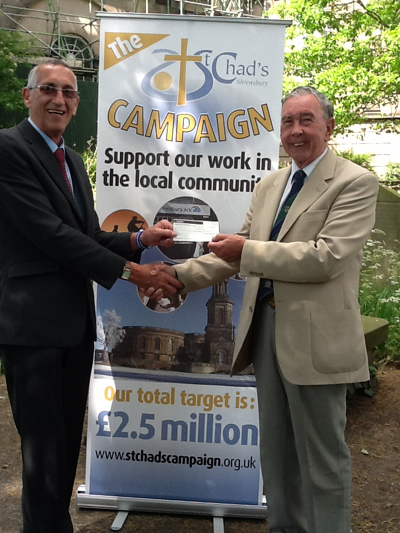 I ALWAYS LIKE HANDING OVER MONEY TO GOOD CAUSES AND St CHADS IS A REALLY GOOD CAUSE. Today I went along to St Chads church to hand over half of the takings we received when we held my Mayoral 100 Brass and Voices Concert at St Chads. 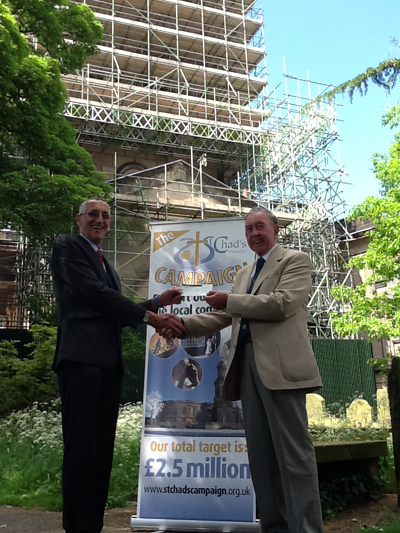 I presented a cheque for just over £550 to Mr David Tudor who is managing the restoration fundraising. 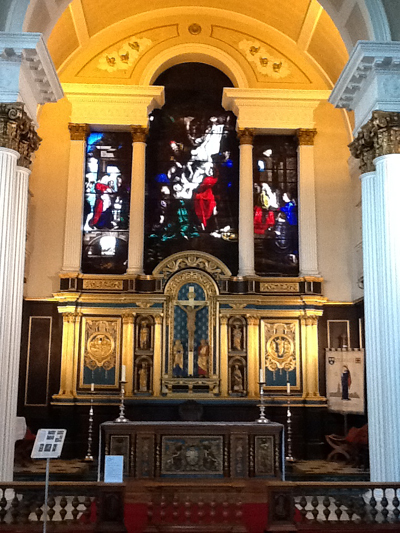 Below are some pictures taken during the handover and a few of St Chads. The sad thing about the handover was that the press for whatever reason declined to send along a photographer and hence it never made the Shropshire Star, seeing so many people turned up on the night and backed our concert I would of thought that the least the editor of the Shropshire Star and or the Shrewsbury Chronicle would have realised the good news factor handing out money in these days of cuts would have with their readership, but alas they missed the boat, yet again. I might sound a tad upset and you would be right as I feel that our local papers should show as much good local news as they can get hold of, as people do buy papers to read good news as well as bad news. I prefer to read good stuff not the doom and gloom bits. 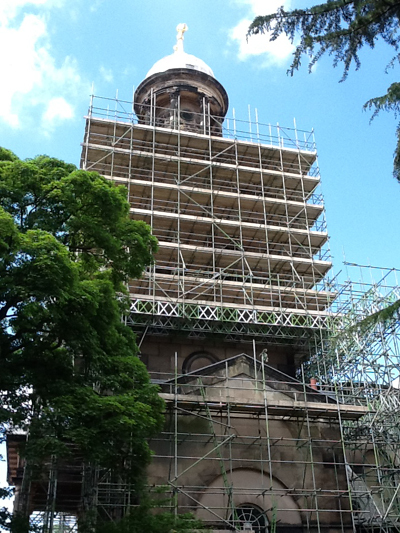 Anyway please enjoy the pictorial below, the pictures were taken by Mr Chris Pritchard of Shropshire Live, as he came along and ran a story on the Shropshire Live Web-Site. Many thanks Chris. 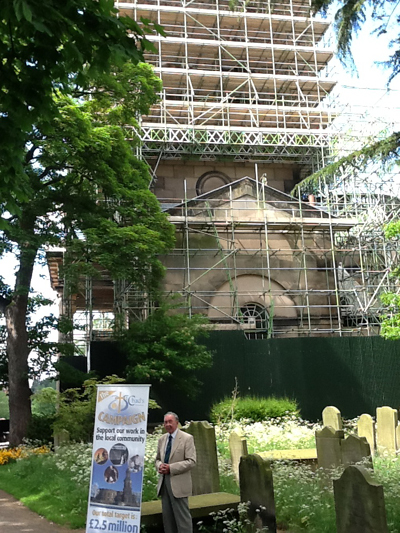 The view we picked for the photoshoot shows a side of the Church that is not often viewed by the public and hence we thought a change might make more people decide to venture into the church yard and have a look around. Below I just had to take a shot of Chris and David whilst they looked for the right place for the handover of the cheque. Chris Pritchard is on the right and David Tudor is on the left. 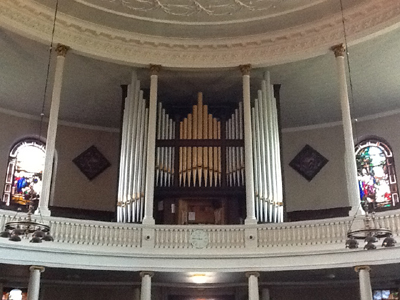 Below are some pictures I took inside St Chads, the organ has been fully restored and there are still loads more to do to the rest of the building and more money is needed. 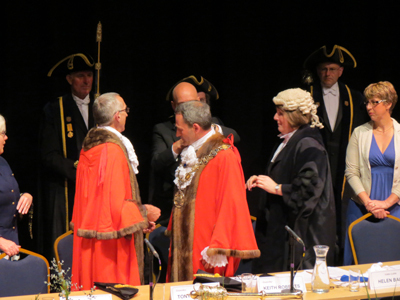 I JUST GOT HOLD OF A FEW PICTURES TAKEN AT FULL COUNCIL MAYOR MAKING CEREMONY ON THE 14th MAY 2012. 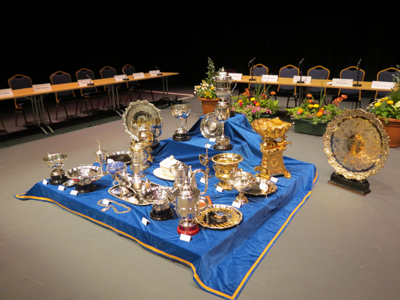 ONE PICTURE SHOWS THE TOWN COUNCILS SIVER COLLECTION ON DISPLAY. THIS IS THE ONLY TIME THE PUBLIC HAVE THE CHANCE TO SEE THE COLLECTION OUTSIDE OF THE GUILDHALL. 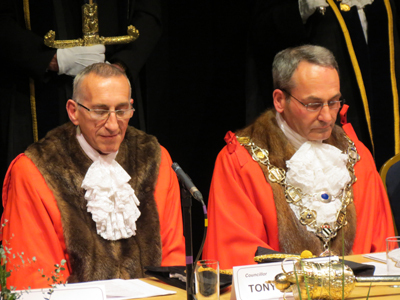 With my Mayoral year over this blog has in real terms come to a close. I will place items on here as and when I have some news about such things as the QDGs and updates on any past Mayoral engagements. There will be one more function that I have to do and that is the Mayors Charity, Small Grants for Small Groups and that will be taking place as soon as we can after the tourch and the Queens Diamond Jubalee events have past. So please do keep coming back and look to see the handing over of our Charity Fund that stands around £4,500 + . 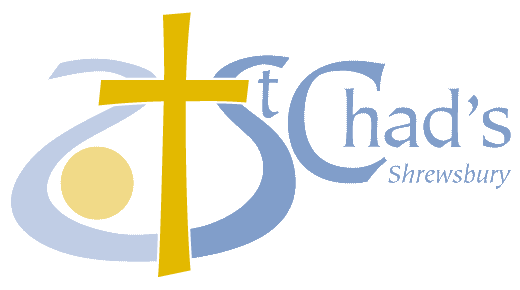 I will also be handing over a cheque for over £500 to the St Chads Restoration fund from our 100 Brass and Voices Concert. Also I will be handing over some money from my Charity Lock Up to the Police Community Fund. So as you see my Mayoral year has ended but I still have some things to do before it is finally finished. 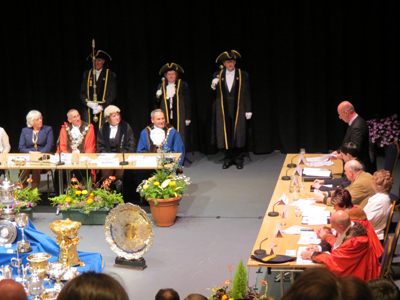 Once again many thanks to all of you who have made both Tricias and My year as Mayor and Mayoress such a fantastic year. The memories we have will stay with us forever, you helped make our year special. 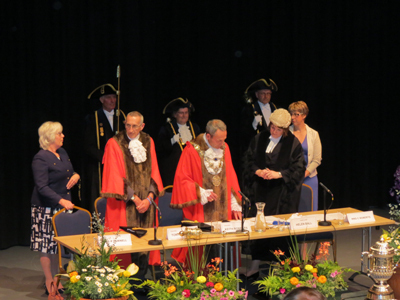 14th MAY 2012 AT FULL COUNCIL BROUGH THE CURTAIN DOWN ON MY MAYORAL YEAR, AND COUNCILLOR KIETH ROBERTS HAS NOW TAKEN OVER AS MAYOR FOR 2012/13. I would like to take a little time to say a big thank you to all of the people we have met when we have been invited to functions all over the area as well as far afield as from Portsmouth in the South to the far North of Scotland, we have also gone from the West Coast to the East Coast during our year in office, so a big thank you has to go to Robert our Mayors Officer who has always been there with us, his family for allowing us to take him away for such long periods of time and at all hours of the day. A big thank you to our Mayors secretary Carol who has managed to maintain my diary throughout the year so that my appointments and my Shropshire Council work fitted in together so well, to the girls in the office Suzi our media person, Hillery who has stood in for anyone who is off to ensure that the mayoral team kept going and to Rebecca who always had those many few minutes that I would always be asking of her to print stuff off or transfer data etc. Also last but not least a really big thank you to Helen our Town Clerk, who I have to say has really been my rod over the year as I always seem to be going into her office asking if I can do this or that and I would like to attend this or that. She has always come up with the advice and help I have needed, some of the ideas really took off such as asking people to step out of their comfort zone. But alas we did not get the sheep in the Quarry DEFRA had a hand in that although Helen did do her best but these ministry people always have the last word. well we will see. I would like to really thank my right hand person Tricia, the Mayoress, my wife who many years ago said to me don’t you ever come home and say you are going to be Mayor as I will not be happy, (Tricia likes to work in the background as she did when delivering Meals on Wheels to people. she just gets on and does it without people really knowing). Well I have a good memory and I do listen, but Tricia has been a fantastic Mayoress and she has been there with me all along except for the odd bout of flu. Without Tricia I would not have been able to do what I did during my Mayoral Year. I would like to let our children know that they no longer have to make appointments to visit us as we are home more often than we have over the past two years (we had one year as Deputy Mayor plus the Mayoral year). Also to thank Karina our daughter for helping with teas in the castle a few times. We will now look forward to some holidays with or Family and Grandchildren. 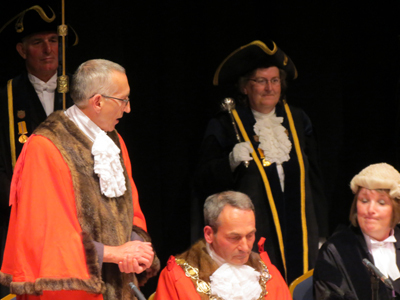 Below are just a few pictures of the new Mayor and myself on the night of Full Council where I handed over the Chain of Office to Cllr Kieth Roberts. I would like to wish him and the new Mayoress well over the next twelve months and hope that they get as much pleasure out of it as we both did last year. We will both be out and about and we will continue to call in and see the many friends we made during our term in office. 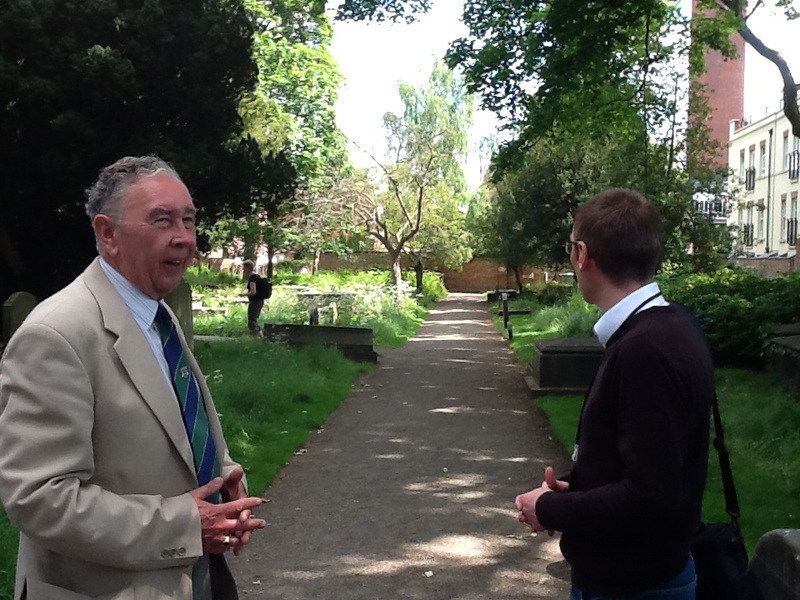 I will now set about working more within my ward of Monkmoor and will soon have a new blog up and running, so please keep coming back as I will still be posting more pictures etc from our time as Mayor as new pictures come in from various people. Above note the look on Helen the Town Clerks face when I said that I was only going to talk for a short time. No one who knows me thought I would be Brief, be Bold and then be Gone! Above note Helens face as I do in fact talk for a very short time and here I am finishing off ready to sit down. This full Council Meeting must go down as the shortest one of all time as it was soon finished. Maybe I should of kept talking for half an hour or so! Above the new Mayor presents me with a framed certificate showing when I was Mayor of Shrewsbury, it is now placed on our sideboard in pride of place. 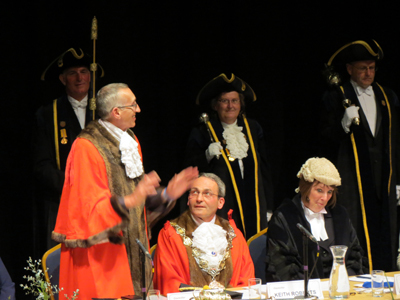 I hope to have more pictures of the Mayor making/Full Council soon so please come back and have a look. 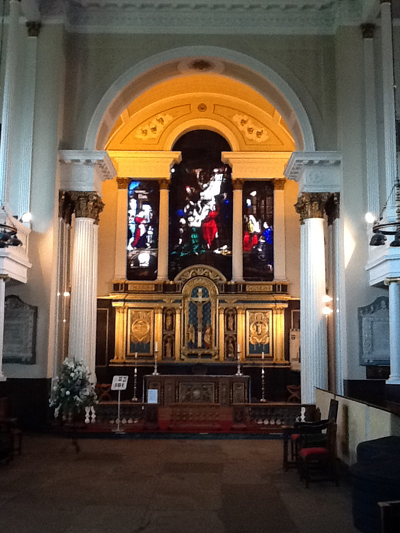 Also to follow soon will be the handing over of money to St Chads from our 100 Brass and Voices Concert. Then there will be the Small Grants for Small Groups from the Mayors Charity Fund. 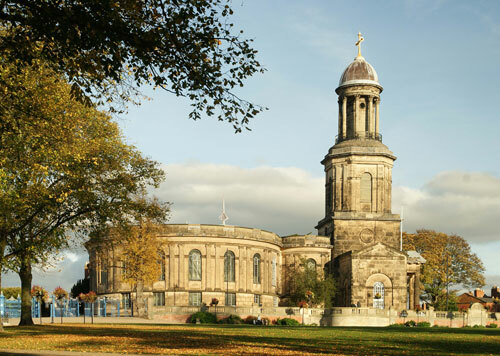 THIS IS NOT AN OFFICIAL LINE TAKEN BY SHREWSBURY TOWN COUNCIL OR ANY OTHER LOCAL AUTHORITY. THIS IS MY OWN PERSONAL VIEW AND PLEA TO YOU. PLEASE HELP US SAVE THIS GREAT REGIMENT WITH A VERY LONG AND PROUD HISTORY 1st THE QUEENS DRAGOON GUARDS. The regiment recruits from Wales, Herefordshire, and Shropshire, and is the senior cavalry regiment, and therefore senior regiment, of the line of the British Army. The regiment is part of the Royal Armoured Corps. I would like to thank all of you who have responded to my plea made last week and I am now back again to say that many more MPs have joined our cause and are prepared to help, but and there is always a but we do need more MPs to join in this important fight to save the QDG’s from the AXE, so once again I make this plea on behalf of the regiment and those serving members as well as past members to contact your local MP and tell them that you want them to save the QDG’s. You can do so by sending an e-mail or by phoning your local office and make the request. 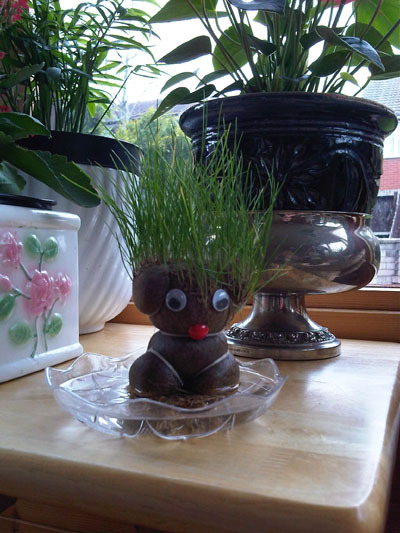 If you need help on what to say then please look at my blog by clicking on the heading below. Where you will find all the information that you should need to let your MP know what it is that you require them to do. I understand that a meeting of Midland MPs is planned to discuss the way forward or as we like to call it the battle plan, but we do need more of the county behind us. The Scots Dragoon Guards are also under threat and it might be good for us all to join forces and have one united front. If you are living in our Prime Ministers constituency would you please contact him and ask him to become involved as he should be made aware of our concerns. Also anyone who lives in a constituency where you have a cabinet member then ask them to get involved and make them aware that this is becoming a Political Issue not a Military one, the MOD can make a suggestion on where an Axe can fall but it is up to our Members of Parliament to say leave the 1st The Queens Dragoon Guards and go back and think again. I am a politician and we have requested officers to think again when the public have let it be known they do not like what was being proposed. So it can work and that is why I am asking you to take just a few minutes of your busy day to help me to get as many MPs either on our side or at least know about our plea and be aware of what it would mean if we lost such a fine regiment with a very long and proud history. Thank you for taking the time to read this blog, my plea and it does not matter how many people contact the same MP as it is then that they understand how important thia is.